As a proud Brit (resident of the US of A for 12 years now), I’d use this space to write about the Sceptred Isle, Blighty, and Old Britannia every week if I could. I’m pretty sure the boss wouldn’t go for it though, and you readers might grow weary of it after…hmm…two columns? Actually as an Englishman, I’d focus on that green and pleasant land first because Scotland (and Ireland too, but that’s not Britain, a whole different country altogether in fact, unless you’re talking about Northern Ireland which isn’t in Britain either but is part of the United Kingdom…still with me?) gets all the good press. Fair enough, they do have some goodish courses north of Hadrian’s Wall, but anyone traveling to Britain to play golf really shouldn’t disregard England entirely. The first of these blogs which appeared back in April, featured the Atlantic Links, half a dozen wonderful links courses in the south-west of England which might not be the very first place you go after saving your cash over several years for the chance to play in Britain, but which you really should consider if you ever go back. England certainly has its share of world-class links (six have hosted the Open Championship), but I suppose, given its rather solid reputation, Scotland is the original and still the best for that sort of thing. In that case, indulge an expat and celebrate with me England’s other great contribution to the game, something Scotland has a few great examples of (Australia and Long Island, N.Y. too) but in which it is somewhat lacking compared to England – heathland golf. 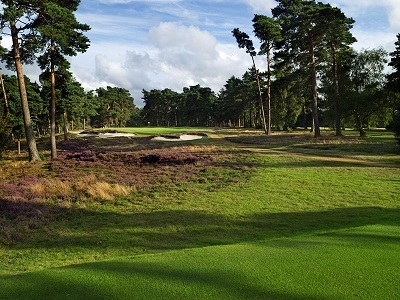 The Surrey/Berkshire sandbelt is awash with beautiful pine/birch/heather courses like Wentworth, Walton Heath, Worplesdon, West Hill, West Byfleet, and Woking; Sunningdale, St. George’s Hill, and Swinley Forest (The Berkshire too but that doesn’t begin with a ‘W’ or ‘S’ so doesn’t sound right) where the turf is so firm and sandy your heart leaps and your hands sing for joy (can hands do that?) when you pinch one off the top. There are other pockets of sand dotted around the country where you find similarly fantastic courses – Woodhall Spa in Lincolnshire; Hollinwell in Nottinghamshire; Ganton in North Yorkshire; Alwoodley, Sand Moor, Moortown in South Yorkshire; Ferndown, Parkstone, and Broadstone near Bournemouth. But my absolute favorite English heathland course is West Sussex in Pulborough, about 60 miles south and a little bit west of London. The course was designed by Guy Campbell, and Cecil Hutchison. Stafford Hotchkin who provided the land for Woodhall Spa and then tinkered with Harry Vardon (original designer) and HS Colt’s (redesigner) classic layout, also played a minor role. It opened in 1931 and is home to a private, typically traditional club that probably wouldn’t mind being called a little set in its ways. Its web site does say it welcomes outside players who aren’t guests of members, but stresses they should be a member of a golf club somewhere and have a handicap certificate – a small card signed by the secretary of your home club that proves you’ve played golf before and aren’t about to churn up the fairways or take six hours to get round (the club is very welcoming of visitors from America). I’m glad West Sussex seems to have opened up a little. Back in the early ‘90s, I was an assistant at a club about 50 miles from Pulborough and, after several attempts, my boss and I had at last been given a tee-time. We went with a couple more assistant pros and asked if we might be able to play our own ball. West Sussex has always preferred foursomes (alternate shot) and took a rather dim view of fourballs, so we knew it was a big ask. My boss was one of the county’s best-known professionals, however, so the club granted us permission, provided we went out between 1.45 and 2pm (or something like that) and didn’t hold up any of the members when they came out following their lunch. We hit from the 1st tee and had gotten about 100 yards down the hole when a profusely-sweating, purple-faced club secretary came puffing after us. “Well, be that as it may, you can’t play a fourball. Two of you have to pick and you must continue playing foursomes. Or I will have to ask you to leave.” (Okay, it’s not quite as noteworthy as Ben Crenshaw and Tom Watson being ordered to get off the course at Muirfield hours after Watson had won the Open, but still). He left, and we laughed like naughty schoolchildren. And, of course, we played foursomes the rest of the day. West Sussex GC is anachronistic, antiquated, old-fashioned, and outdated. It’s an archaic club made up of fuddy-duddies who drink pink gin and would be on good terms with some of P.G. Wodehouse’s more eccentric characters. But it plays over a spell-binding course and, when it comes to pace of play, it might actually set a standard to which the rest of the world might one day adhere.